Note.-- The northwest (Carbon River and Mowich Lake) area, the Southwest (Nisqually entrance) area and the Paradise (south-central) area have been updated. The other two areas, the northeast (White River and Sunrise) and southeast (Ohanopecosh), are scheduled for later in 2016. For the purposes of presenting a photography guide to Mt. 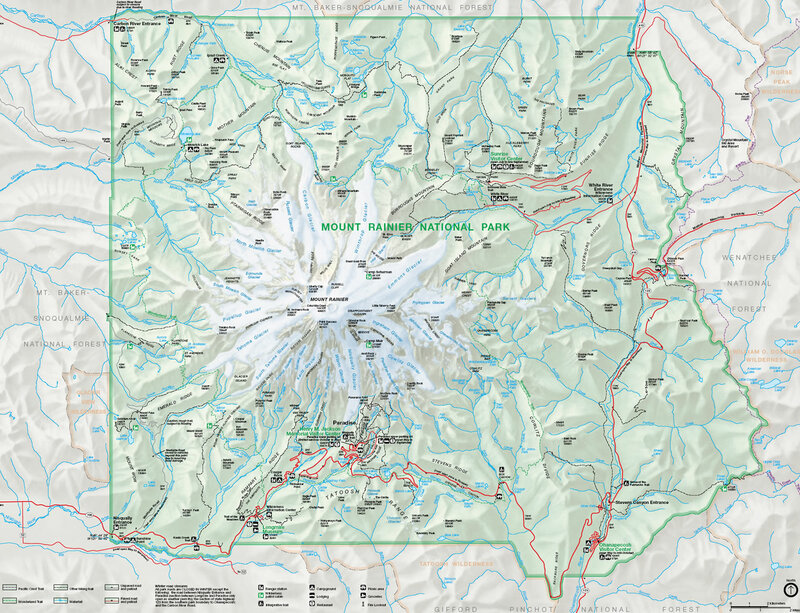 Rainier NP, I have divided the NP into quadrants, based on the four access highways and entrances to the NP, and the Paradise area where the main visitors center is located. These areas will be presented in general below where you can get additional information with the link for each area, see the travel overview for a map and general travel information. You can also click on the map or links above to navigate to individual area. You can get a larger view of the map NP map (560KB jpg). You can get an overview of the larger area of Mt. Rainier NP and a description of the general of the photography are in Mt. Rainier NP. Here is a brief description of ht area in the area guide. The Paradise area is most visited area of the NP with the Jackson Visitors Center, Mountain Guide Center, and Paradise Inn. This area is also the longest drive from Seattle, Tacoma, or Portland, as it's just south of the mountain and near the center of the Park, accessible only by the highways inside the Park. Next to the Sunrise area the Paradise area has the closest view of Mt. Rainier with many short trails to viewing areas, great for photographs. The Northeast area is most easily accessible area of the NP from Seattle, with the White River entrance and the road to Sunrise with the visitors center which is open July through September. It is accessed via highway 410 from Seattle on the way to Cayuse Pass or from Yakima over Chinook Pass. Highway 410 continues south into the Park as highway 123 to the southeast area and highway 12 as well as highway 706 to Paradise. The Southeast area is the most accessible entrance from Portland via Interstate 5 to highway 12 or via the backroads east of Mount St. Helens Volcano Monument to Randle. It can also be accessed via highway 12 from Yakima over White Pass at Naches where it splits with highway 123 to highway 410 at Chinook Pass. You can also access the area via highway 7 at Morton to Elbe. The Southwest area is the most accessed entrance for visitors from Tacoma via highway 7 south of Tacoma, or via highway 161 from Puyallup. The highway becomes 706 at Elbe to the Park entrance, to Paradise (Jackson visitors center), and onward to highway 123 in the southeast area. This area can also be accessed via highway 52 at Randle off highway 12 to highway 706 at Ashford. The southeast and southwest areas are connected inside the NP by the Stevens Canyon Road, highway 706, between Paradise and the Ohanapecosh entrance off highway 123, and outside the NP by Skate Creek Road which connects to highway 706 west of the Nisqually entrance near Ashford to highway 12 at Packwood which connects to highway 123. The Northwest area is accessed from either Seattle or Tacoma via highway 165. It is the least accessible as it's via rural highways from various locations to the split to the Carbon River entrance and the Mowich Lake entrance, each with their own access to the NP. 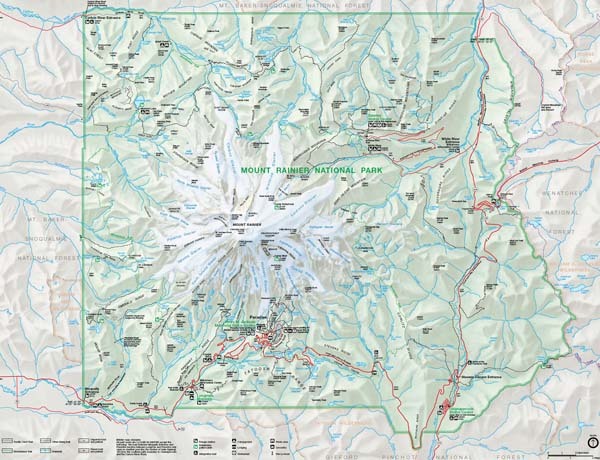 In addition the Carbon River road is closed at the NP boundary (trail only), and the Mowich Lake road closes seasonally, usually October or the first significant snowfall to early July, earlier depending on snowmelt. Mowich Lake Entrance, The road closes in October or first heavy snowfall. The campground will be open with a permit through the fall and winter. Below are sources for additional information about Mt. Rainier and the NP. Please send e-mail if you have any questions.